I discovered what I think is a bug in SharePoint 2013….curious if anyone else has experienced this. I created a “Customer” List based off the Custom List Template. Next, I created a “Customer Tasks” List based off the Tasks List Template and added a Lookup Field to my Customer List. 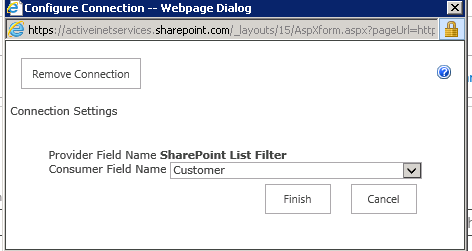 I add a SharePoint List Filter to my web part page which looks for the Name Field in my Customer List. I add the Customer Tasks List to the Web Part Page. On my Task List Web Part, I go to “Connections” then select “Get Filter Values From” and match up the appropriate columns. When I select a value to filter, the Filter Icon shows next to the Customer column in my Tasks lists but everything in the List shows. It’s like it thinks it’s filtering but it didn’t. Weird thing is, if you click on the Filter Icon then click Clear Filters, it filters as expected. I created another Tasks List to test and same result. Next, I create a Custom List and based it off the Task Template and set up the Web Part Connection and to my surprise that worked just fine! 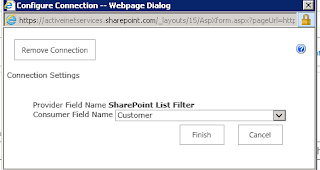 So I can only conclude that this is some bug in SharePoint 2013 with the Task List Template and Web Part Connections. Has anyone else experienced this? Do you have a resolution? Thanks for the post. I was experiencing the same issue, and the above solution for ReNiS worked for me. This prevents the Completed checkbox functionality – is there anyway to keep this field and still fix the issue explained above? I was experiencing the same issue, and the above solution for ReNiS worked for me also. Great solution! Thanks April & ReNis. A blend mind and crucial words. Exactly what I was scanning for. April Dunnam - SharePoint Siren © 2019. All Rights Reserved.